The Arlo Audio Doorbell features a motion sensor, a speaker, and a microphone, so users are alerted to someone at their door and can speak to them remotely via the Arlo app. But if you want to see your visitors, you’ll also need an Arlo camera. The basic premise makes sense. If you own an Arlo system, you probably already have a camera facing your front door or porch, so why duplicate that coverage with a video doorbell? And less sophisticated gear means a lower price: The Arlo Audio Doorbell costs $60, versus $170 for the Ring Video Doorbell 2 and $229 for the Nest Hello. But there’s a disadvantage, too: By relying on a discrete security camera, rather than one inside the doorbell, your view will be down at an angle (because you’re unlikely to mount an Arlo camera at eye-level, where it could be easily pilfered). So it could be more difficult to make out someone’s face with the Arlo camera. Also, the Arlo Pro 2’s field of view isn’t quite as wide as some video doorbells. Here’s an image from the Arlo Pro 2 (top) and the Nest Hello. The Nest doorbell sees more of what’s in front of the door than the Arlo camera does. 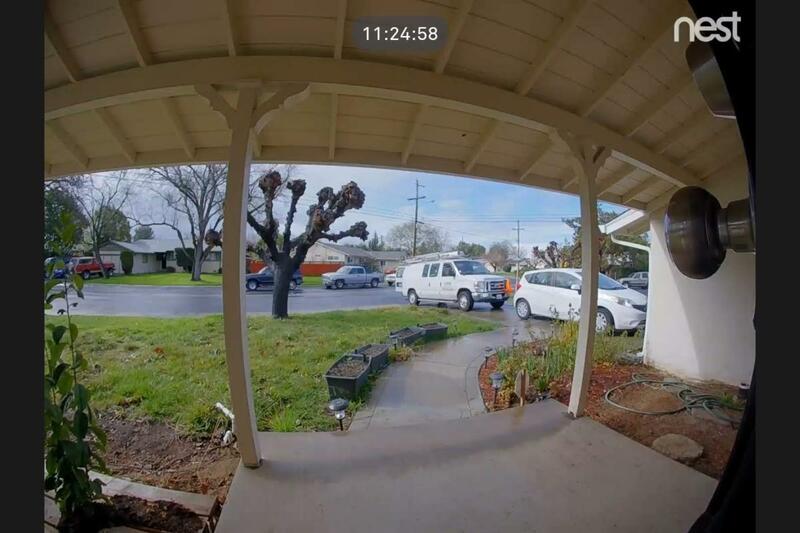 An image from an Arlo Pro 2 camera. An image from the Nest Hello video doorbell. A view from an Arlo Pro 2 camera mounted above a door. The Arlo Audio Doorbell is pretty easy to install. It will run on two AA batteries. Arlo supplies a couple of batteries in the box along with mounting screws and a small installation booklet. Assuming you have a wooden frame around your door, you can have the doorbell screwed on in about a minute. There’s a small lock screw at the bottom of the doorbell to secure it to the mount that will prevent anyone from pulling it off. 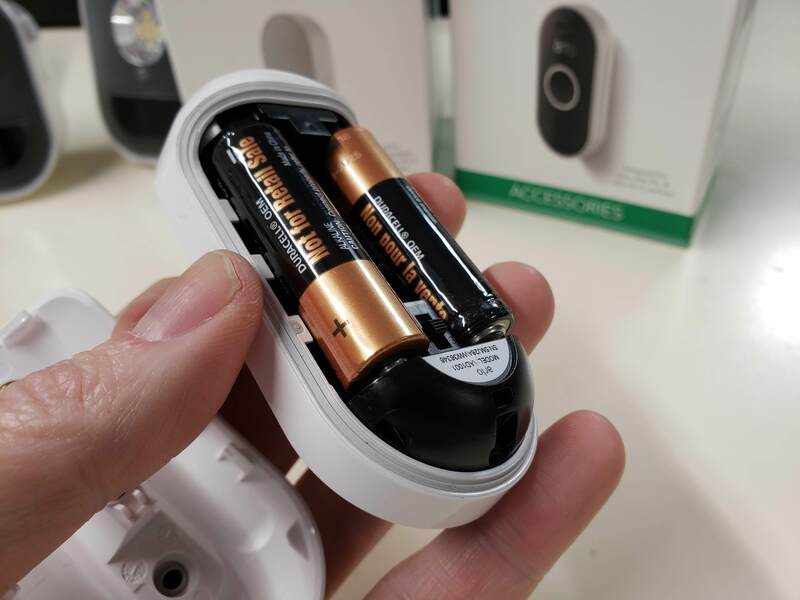 The Arlo Audio Doorbell can run on two AA batteries if you don’t have existing low-voltage doorbell wiring in place. The doorbell connects to the world via the Arlo Base Station. If you have an existing Arlo system, then you already have one of these. If not, then be aware that you’ll need to buy one. 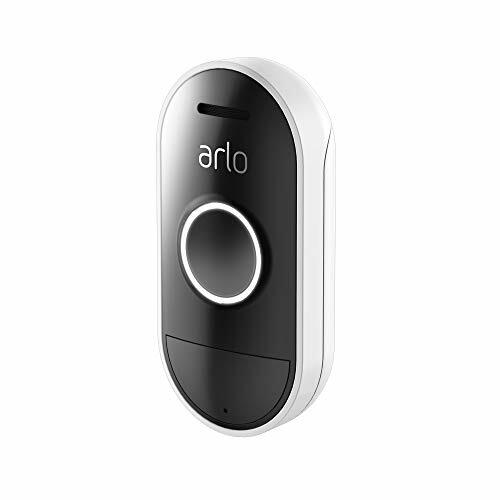 You cannot use this doorbell as a standalone device, but Arlo offers the doorbell in a bundle with a base station and Arlo Pro 2 camera. Setting up the doorbell is a quick task. 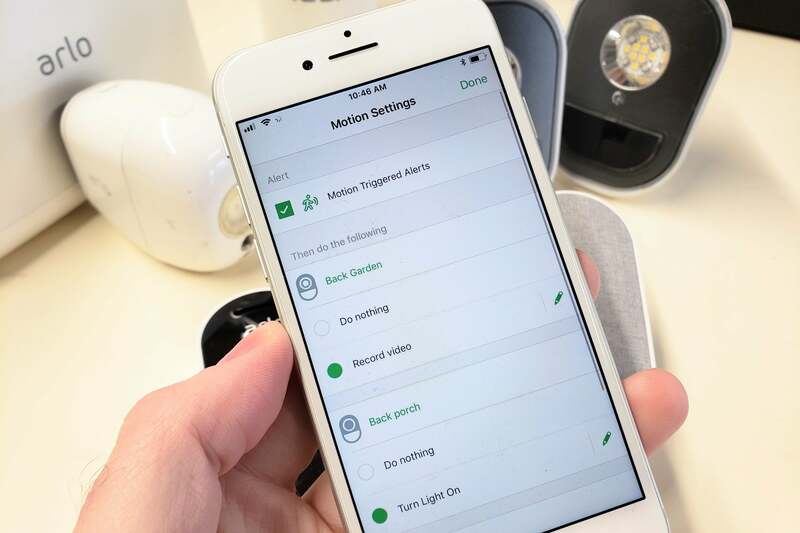 As soon as it’s powered up, it enters connection mode and from then it takes just a couple of taps in the Arlo app to add it to the system. If you already have Arlo cameras, the app will then ask for a companion camera. This is the camera that will record video when someone presses the doorbell. Selecting a camera to use with the Arlo Audio Doorbell. 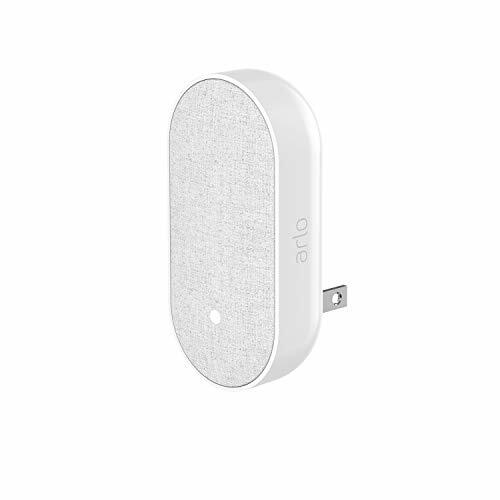 Arlo also sells a companion door chime. It connects into the same Arlo network and rings when the doorbell is pushed. 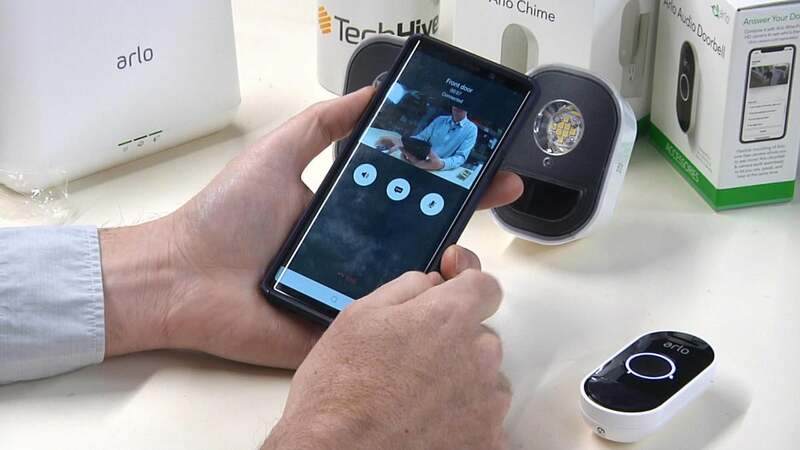 If you have an existing wired chime, the Arlo Audio Doorbell will trigger that, but if you don’t have one or if you want a chime in a different part of the house, the Arlo Chime is worth considering. It’s about the same size as the doorbell, has a gray fabric face, plugs into a wall outlet, and it costs $50. The doorbell includes a motion sensor that can alert when someone comes close to your door but doesn’t press the bell. It also triggers a white ring that glows around the doorbell button as someone approaches. This should get the person’s attention and help guide them to the doorbell, but it will also put a visitor on notice that their presence has been detected. Once I hooked it up with the Arlo Chime, pressing the doorbell button triggered the chime in less than one second. A couple of seconds later, my phone started ringing with the sound of an incoming call. Upon answering, I saw video from the companion camera and audio from the microphone in the doorbell. Your audio is muted when you first answer, so whoever is at the front door can’t hear you. Answering a call from the Arlo Audio Doorbell. Pressing the mute button opens audio from the phone and a two-way conversation is possible, assuming the other party can hear you. In all of the testing I did of the doorbell, my biggest complaint wasn’t the lack of a camera but the low volume level of the doorbell. It might be fine on a quiet street, but on a busy street the person at your door is sure to have a tough time hearing you. I checked the volume setting and it was already set to 100 percent. Arlo said it is looking at ways to increase the volume and clarity of the audio. The Arlo app allows owners to program different triggers. If an Arlo camera on the front of the house senses motion, for example, lights on the front and side of the house can turn on. The doorbell ties into this and it’s possible to, for example, have all your Arlo outdoor lights come on if the doorbell sense motion. During testing I discovered that the Android app contains a bug that only allows a single trigger to be set with the doorbell. Arlo said it’s working on fixing it. The iOS app doesn’t have the bug. 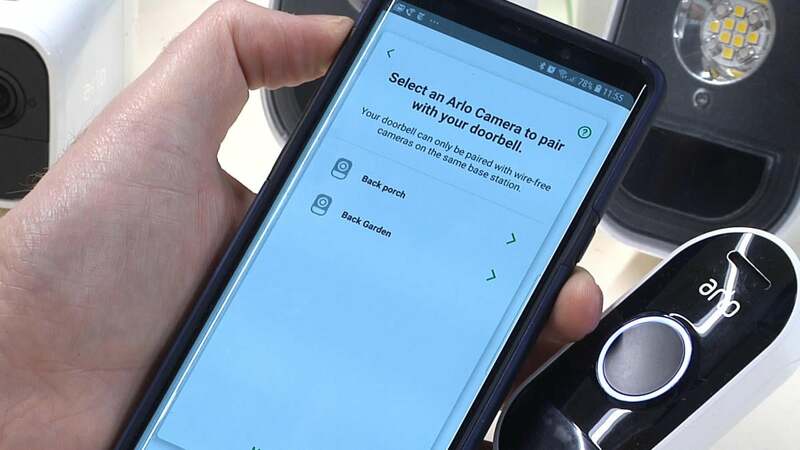 Progamming triggers on the Arlo Audio Doorbell app. The Arlo Audio Doorbell scores points for being simple and cheap but that’s at the expense of a video camera. If you have an existing Arlo security system, it’s a natural choice. It’s also one of the few choices if you live in a place where there are legal restrictions placed on capturing video of strangers. If you don’t have an Arlo system, the low cost of the doorbell is offset by the need to buy a kit with an Arlo base station. Once you get to that expense, you might want to consider a video doorbell that can connect directly to your network without the need for a base station. TechHive has a ranking of our favorite connected doorbells. As we’re talking money, however, you should consider the monthly running cost. Many video doorbells require a cloud storage subscription of around $30 to $50 per year. Without storage in the cloud, you can only see a live view from those doorbells, and those suscriptions can easily double how much you’re spending over five years. Arlo offers a generous seven days of free cloud video storage with its cameras, so if you buy the doorbell and add a camera, you won’t be faced with a monthly bill unless you want even more cloud storage. My only real complaint is the volume of the speaker built into the doorbell so consider how quiet or noisy an environment it will be used in. 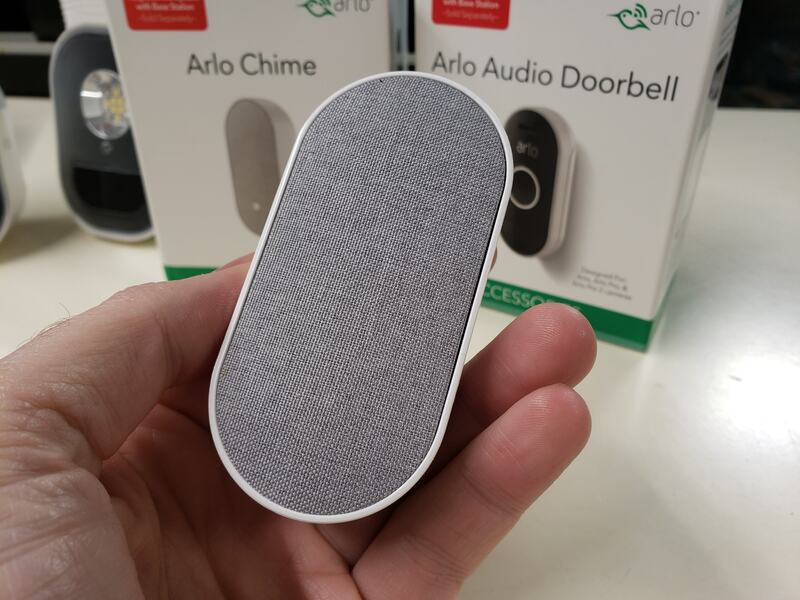 The Arlo Audio Doorbell is best suited to homeowners who have already invested in the Arlo home security ecosystem (or who plan to). The absence of a camera renders it less expensive than a video doorbell, but a discrete Arlo camera will deliver a less optimal field of view.